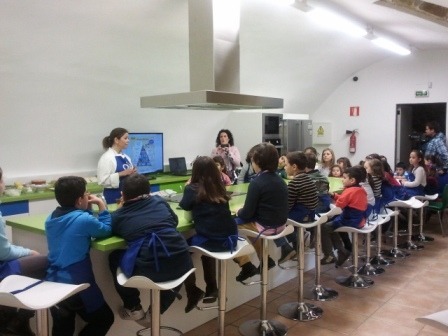 Children’s Cookery Workshops | Oleoturismo en Jaén y Úbeda, tienda y catas de aceite, un museo sobre aceite que ver en Úbeda. We organize cookery workshops for all ages and educational levels, which are personalized and include both parents and children. The objective of our breakfast and snack workshops is to instill wholesome eating habits for a healthy and balanced diet. Including all of the nutrition fundamental to child growth and development, having extra virgin olive oil as the primary component, a pillar of the Mediterranean diet. They will learn the food groups and their properties and stimulate all of their imagination, creativity and abilities through combining flavours, forms and colours. They will also learn to make their own snacks, lunches and breakfasts using both technical and very basic methods, developing their abilities through fun activities. Examples: Ochios (traditional bread of Úbeda), sugar bread, olive oil bread, pizzas, biscuits, midnight bread, magdalenas etc. which the children can taste and later take home. Please contact us for further information or to reserve a place. Groups of 15 children minimum per workshop.